We have a new School Board Director. Linda Walker was appointed last night to replace the seat left vacant by the resignation of Sara Yassem. Ms. Walker gave a great speech and out shined the few that actually showed up for their interviews. Ms. Walker is a retired educator. She has been through consolidation. She cares about the students and the quality of their education. She is going to be an asset. She really doesn't have big shoes to fill. She is replacing a school board member who was border-line illiterate. If any of you have ever received emails from former director Yassem, you will understand. She writes with no capitalization, no punctuation, and no sentence structure. Ms. Yassem was also a puppet, who only said what she was told to say and voted how she was told to vote. With her puppet masters now gone, she became more vocal, since they no longer had a voice on the board, they used her as their microphone. There was a plan up their sleeve with her resignation and it looks like their plan backfired. Welcome Ms. Walker! Let's move forward and bring this district into the next century with quality education with fiscal responsibility! Well, here we go once again. The current school board is proposing to close Elderton High School once again. Once again, HERO has come out screaming, yelling and protesting. They have accused the current board and those who support them of "Lies, Corruption and Bigotry". See that picture above? That photo was taken on a Thursday morning at 11:30 am, from the parking lot of a nearby doctor's office. That is an Eldeton High School gym class. 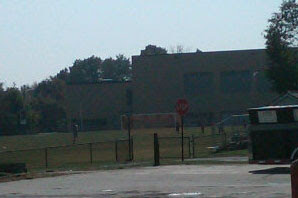 You can clearly see four of the SIX students that are in that gym class. Six kids. We are paying a gym teacher to conduct a gym class for six kids. They were playing soccer, three on three with no goalies. If you don't see that as a waste of taxpayer money, then you don't understand Business and Economics 101. We can't afford four high schools, especially one that graduates such small classes as Elderton. We employ too many teachers. Yes, we cut positions last year, but those were in the other three schools. EHS has to have the minimum number of teachers, by law, so they have the luxury of teaching classes of eight students in most cases, while the other schools have triple and nearly quadruple those amounts. HERO wants you to believe that the current board planned on spending this money on a new school all along. They want you to believe that they LIED to you while campaigning, quoting from this website in the Seven Questions for the Candidates section. Fact is, at that time, we were all under the assumption that we could give the money back. We found out that wasn't possible. It's too expensive. HERO wants you to believe that the money wasn't offered to other schools within the ARIN Intermediate Unit. Fact is, no one wanted it. Why would they when they can get their own bond money at nearly half the rate? HERO wants you to believe that we should be offering the money to ALL schools in PA. Fact is this will take nearly nine months to do and we have no idea if the IRS will approve of this transfer of funds. Do we really want to keep paying interest on this bond money while doing NOTHING with it? Fact is, we are STUCK with this money. We can only spend it on buildings. Intelligence tells you to spend it on something new instead of fixing up buildings that are full of raw sewage and black mold. Instead of renovating schools with six to eight kids in a classroom. HERO wants you to know that even though their graduating class, last year was 26, that this year it is 51, close to the number of graduates from West Shamokin. What they don't tell you is the numbers drop again for next year. HERO wants their cake and eat it too. They want their children to get the equivalent of a private school education at the cost of the other taxpayers. We are sure the Kittanning, Ford City and West Shamokin parents would love to have their kids in classes with six to eight kids. HERO wants you to believe that West Shamokin was over crowded when the Elderton students were there a few years ago. The most common complaint you will hear is that the kids didn't have enough time to eat their lunches. They had to stand in line for their lunch and it didn't allow enough time to eat. When the Elderton students came from such a small school, they obviously just walked up and got their lunch and had the luxury of sitting down and eating the entire lunch period. In almost every other school, you have a line. Lines are reality, wait until they get to college. HERO wants you to believe that it's all about "Lies, Corruption and Bigotry". Where's the bigotry? There are several reported cases of Elderton students that were involved in racism while at Ford City High School. Maybe if these students weren't so sheltered and exposed to the real world they would learn that bigotry and racism is not the answer because they would be more exposed to other races. We would like to know how bigotry fits into all of this. Bottom line is, here we go again. The same fight we've been having for DECADES. It is time to fix this district and fix it right. Focus on the facts. Focus on the figures.